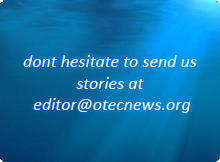 OTEC – The most exciting work in OTEC probably goes on in India and on Hawaii. In India, the Sagar Shakti 1 MW OTEC barge was going to be deployed in September. However, we didn’t hear about what has delayed it. On Hawaii, at NELHA, the work on the 55 inch pipeline and a pumpstation is ongoing. Mariculture – has some minor positive stories this year, such as the Abalone farming project in Australia. Otherwise, the fish stories are mainly about doom and gloom with regards to depleted fish stocks. Hydrogen economy – This has become a popular term “The Hydrogen economy”. Even the US President Bush Jr. talked about it. However, it still is a long way away and although serious work is in progress to make it a reality, we predict another decade is needed before we start seeing a real impact from it. Pollution – Global polution is high on the agenda in the media, but this was the first year when we started to see actual concequences of global warming through raising sea levels. Tuvalu is to start evacuating its people in 2003. Global warming is also eating away at the Arctic ice.